My YouTube rabbit hole started with Numberphile, the maths-based channel that forms part of Australian videographer Brady Haran’s YouTube empire. (Haran also has channels on chemistry — hosted by the splendidly coiffed Sir Martyn Poliakoff — physics, computer science, food science, and many other subjects.) Suddenly, I’d found something I never knew I wanted: a channel that explained fascinating mathematical concepts in a way that was accessible and entertaining, and didn’t require me to complete two hours of tedious homework. From there I found the channel that I think perhaps best exemplifies the virtues of YouTube pedagogy: Grant Sanderson’s maths channel 3Blue1Brown. Sanderson’s soothing voice and the lovely self-penned music that accompanies his narrations are appealing enough, but the real draw of his channel lies in its animations. Sanderson codes them all himself in Python, and the result are images that are beautifully intuitive, providing visual explanations for concepts that in high school were just abstract symbols on a yellowing page. 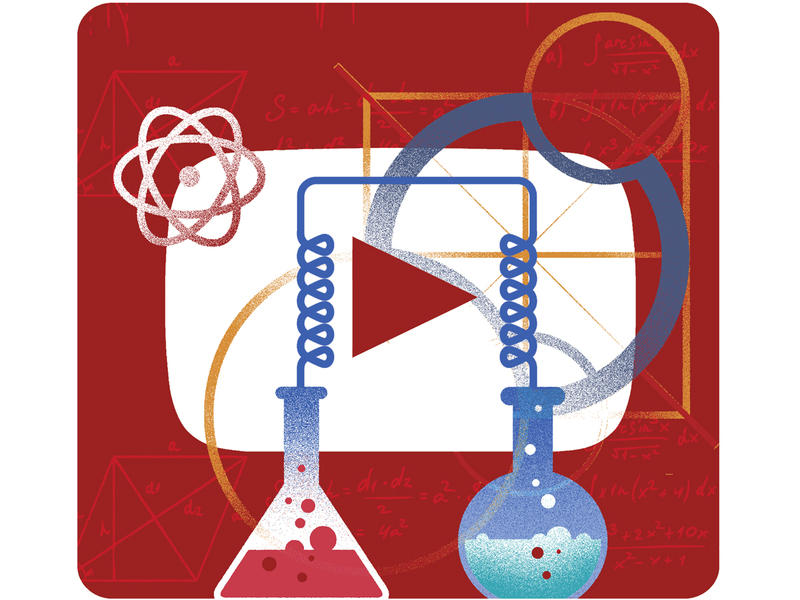 It’s not just mathematics that benefits from the possibilities for visual illustration that YouTube allows. If you search, you’ll find people who take similar approaches to physics, chemistry, biology, electronics, along with a heap of generalists who address all these topics and more. Some of the channels are pleasantly DIY, like Looking Glass Universe, presented by a nameless Australian physics doyenne who illustrates heavy-duty quantum mechanical concepts with hand-drawn stop-motion animations. Some are one- or two-person operations, like astrophysicist Nick Lucid’s The Science Asylum, which uses an ongoing storyline about a mad scientist and his army of clones to provide entertaining and remarkably concise explanations of a variety of physics-related subjects. Others have the backing of big studios: American TV channel PBS, for instance, funds several science-related web series, including astrophysics favourite SpaceTime, Eons (about biology and palaeontology), and Infinite Series (about maths, but sadly discontinued). And just like everywhere else on the internet, there are some true weirdos — take StyroPyro, for instance, a channel run by youthful-looking 25-year-old chemistry graduate Drake Anthony, whose hobby is building terrifyingly powerful laser contraptions in his garage. (When most people say, “Don’t try this at home”, they’re covering themselves against litigation; when Anthony says it, he means it, because his creations can and will kill you.) It’s kind of remarkable that he’s somehow still on YouTube — they’ve warned him multiple times and banned several of his videos, but he’s still there! — because he’s probably on every single FBI watch list in existence.